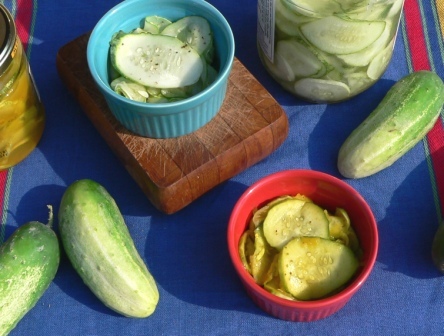 Yesterday I confessed my new obsession with cucumbers and shared a healthy version of refrigerator pickles using apple cider vinegar and honey. You can find that recipe here. I also shared that I found another refrigerator pickle recipe that was so unique I just had to try it. Instead of the traditional vinegar and sugar, the base of this recipe is lemon juice and honey. Then you add a variety of spices including turmeric and cloves. I am no pickle connoisseur, but I would say that these pickles resemble bread and butter pickles with an interesting kick from the clove. I did a quick search for bread and butter pickle recipes and found that turmeric is pretty standard, cloves appear occasionally and lemon and honey are rare. I served both pickle recipes to an expert my pregnant sister in law. She had not had refrigerator pickles before today. She enjoyed the Honey Sweetened Pickles and could not taste the honey. When she tried the Honey Lemon Pickles she agreed that they tasted similar to bread and butter pickles with a kick. She could not identify the kick as cloves. I have to admit, I don’t like to eat these pickles straight from the jar. Maybe this is because I don’t really like bread and butter pickles. But I added them to my hamburger last night and my turkey sandwich today. I really, really liked what they added to my sandwiches. This makes 3 pints so I halved the recipe. Put cucumbers and onions in a large glass bowl. Add remaining ingredients to a saucepan. Bring to a boil and cook and stir until honey is dissolved. Pour the liquid over the vegetables and stir well. Let the cucumbers cool while keeping them submerged. Transfer pickles to jars and refrigerate at least 24 hours. This recipe came from From Asparagus to Zucchini. This sounds like a really cool recipe! I don’t like bread and butter pickles, though, so I know I wouldn’t like them, but I love that this recipe is so healthy:) It makes me wish I liked bread and butter pickles, lol! I am in the middle of making these pickles. I do have a question though. You say “while keeping them submerged” as everything cools. However, 8 cups of vegetables cannot submerge completely in 1-3/4 cups of liquid. Is there an error in the quantities? Thanks! Never mind! I chopped a few too many vegetables. I ended up with 4 pints. If I really had 8 cups of veg the liquid would have been just fine.